This is a vanilla cake. But it’s not just any old regular vanilla cake. It’s a vanilla cake brushed with a sweet cream syrup, slathered with butterscotch frosting, and covered with nonpareils. The recipe for this little beauty comes from Cake Magic: Mix & Match Your Way to 100 Amazing Combinations, a cookbook that provide so many combinations of cake flavors, syrups, and frostings that you could bake a cake every day for several months and never make the same thing. Preheat the oven to 350F. Butter the bottom and the side of two 8 or 9 inch round cake pans [or a 10-inch Bundt cake pan, a 13×9 inch sheet cake pan, ). Dust with flour to coat, then invert and tap out any excess. 24 cupcakes- use liners, no need for greasing and coating the tins. In a large bowl, stir together the flour, sugar, baking soda, baking powder, and salt until well combined. Stir in the yogurt, butter, water, vanilla, and eggs until moistened and no lumps remain (be careful not to overmix). Divide the batter into the prepared pans. Bake until the layers are domed and golden brown, and a few moist crumbs cling to a skewer interested in the center of the cake, 30-40 minutes (40-50 minutes for a Bundt, 25-30 minutes for a 13×9-inch cake, and 20-25 minutes for cupcakes). While the cake is baking, make the sweet cream syrup. Combine the sugar, cream, and salt in a small saucepan and bring to a boil over medium-high heat. Stir to dissolve the sugar. Use the syrup warm or let it stand covered, until it reaches room temperature. Note: Sweet cream syrup will keep, in an airtight container in the refrigerator, for up to 1 week. Reheat in a small saucepan over low heat before using. After removing the hot cake layers from the oven, pierce them, while still in their pans, at one-inch intervals with a skewer or a paring knife to create channels for the syrup to seep into the cakes. Pour or generously brush the syrup over the surface of the hot layers, dividing it between them as evenly as possible. Transfer the soaked layers (still in their pans) to a wire rack to cool completely (1 to 2 hours). When they are cooled and no longer wet to touch, carefully turn them out of their pants and frost. Make the frosting while the cake cools. Combine the butter, milk powder, salt, and two cups of the confectioners’ sugar in a large bowl, and beat with an electric mixer on low speed until incorporated, about 1 minute. Add the remaining confectioners’ sugar, and beat on medium speed until the frosting is pale and no longer grainy, about 2 minutes. Add the butterscotch flavor (or vanilla extract), and beat until frosting is very light and fluffy, about 2 minutes. Note: the frosting will keep in an airtight container in the refrigerator for about 1 week. Before using, bring it back to room temperature and stir vigorously or beat it again for best results. Frost the cooled cake layers. It’s the middle of the holiday rush, so let’s keep this short and sweet. This gingerbread cake is 100% verified delicious. It’s easy to make, super flavorful, and tender, and has a slightly crispy top due to the gingerbread glaze. And you can make it look fancy by baking it in a bundt cake pan (my favorite bundt cake pan makes four mini cakes). Go bake this! Lightly grease a 10- to 12-cup bundt-style pan or a 9-cup quartet bundt cake pan. Add the eggs one at a time, beating well and scraping the bottom and sides of the bowl after each addition. 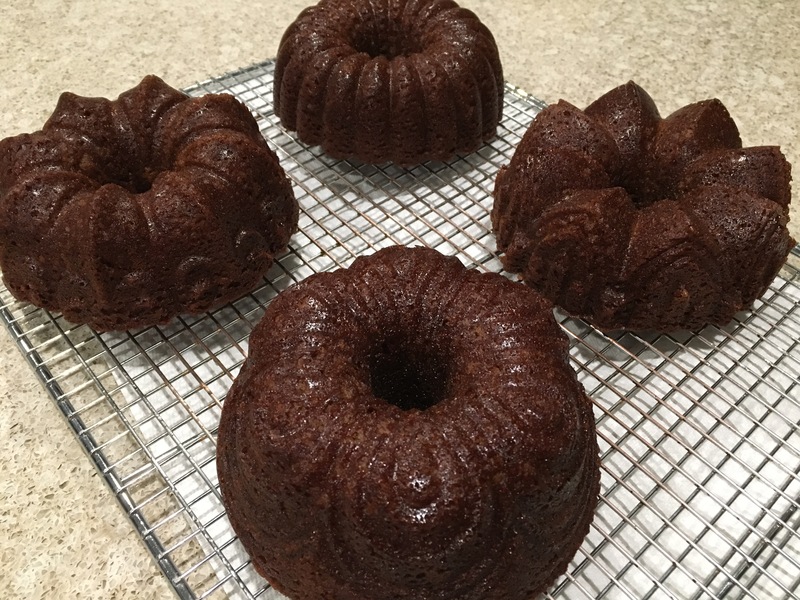 Bake the cake for 55 to 65 minutes if using a 10-12 cup Bundt pan, or 30 minutes if using a quartet Bundt pan, or until a cake tester inserted into the center comes out clean. While the cake is baking, make the glaze. Whisk together the water, spice, and sugar, and cook over medium-low heat until the sugar melts and the mixture thickens a little. Set aside. Remove the cake from the oven, cool it in the pan for 10 minutes, then turn it out onto a rack. Brush the cake with the glaze, and allow it to cool completely before serving.